We had the most wonderful Christmas season this year! 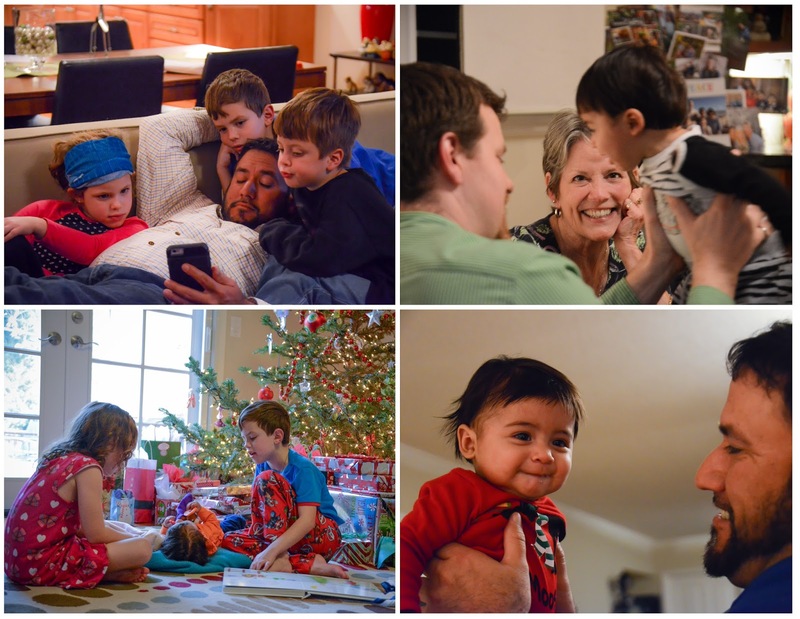 We had family at our house for 3 weeks straight with a maximum of 10 people sleeping at our house at one point, which might sound overwhelming to some, but it was SO much fun and such a blessing in so many ways. Living in California with most of our family in Louisiana and Texas, but also spread from Connecticut to California, means it's harder to get together. Having so many people willing to travel to spend time with us was amazing! The same day my mom left town, Susan, Leslie, Philip, Mitchell, and Taylor arrived! Baby Taylor was often the center of attention, providing lots of entertainment and smiles. He has the most infectious laugh, which the kids enjoyed getting him to do by playing peek-a-boo. They also discovered how much Taylor loves to listen to singing. 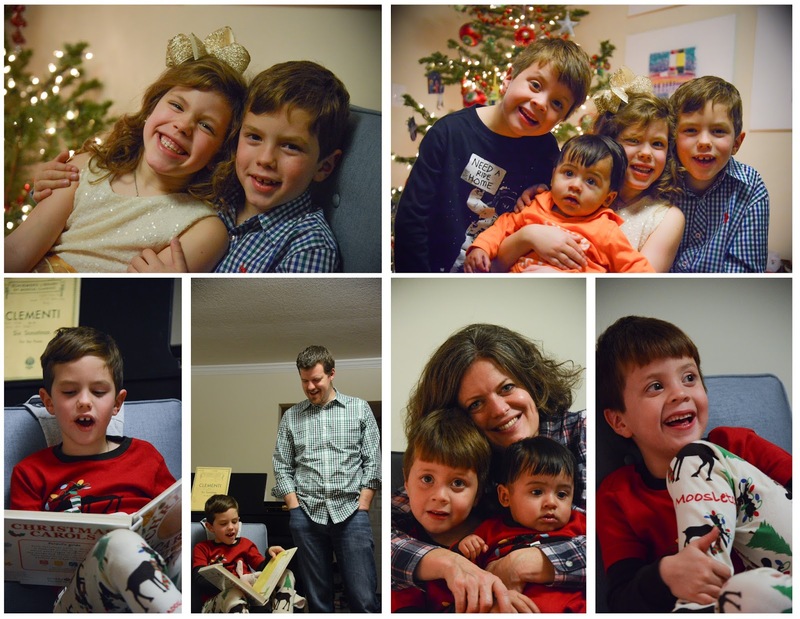 Any time he would fuss, they would start singing him Christmas songs and lullabies, which quickly calmed him down. The kids were also entertained by playing with fun Star Wars apps on Uncle Philip's phone! Their first full day here was mostly spent hanging out. However, Audrey had a gymnastics camp to attend, so Leslie and Philip took Mitchell and Jackson to see the new Star Wars movie. This was Jackson's second viewing of the movie...we went as a family for Ross' b-day while my mom was in town. We spent most of Christmas Eve visiting, preparing food, decorating cookies, and playing. We got a few pics of the kids before we left for church. They did amazingly well in the service and loved lighting candles and singing "Silent Night." When we got home the kids all put on their matching Moosletoe pajamas, and Jackson led everyone in singing a few more Christmas carols. 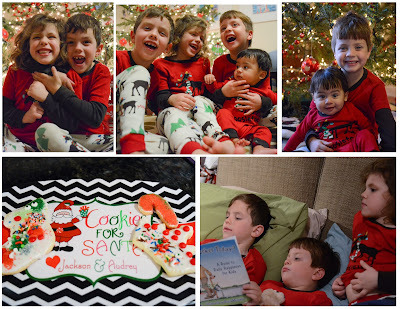 After a few more group photos under the tree, the kids laid out their cookies for Santa. 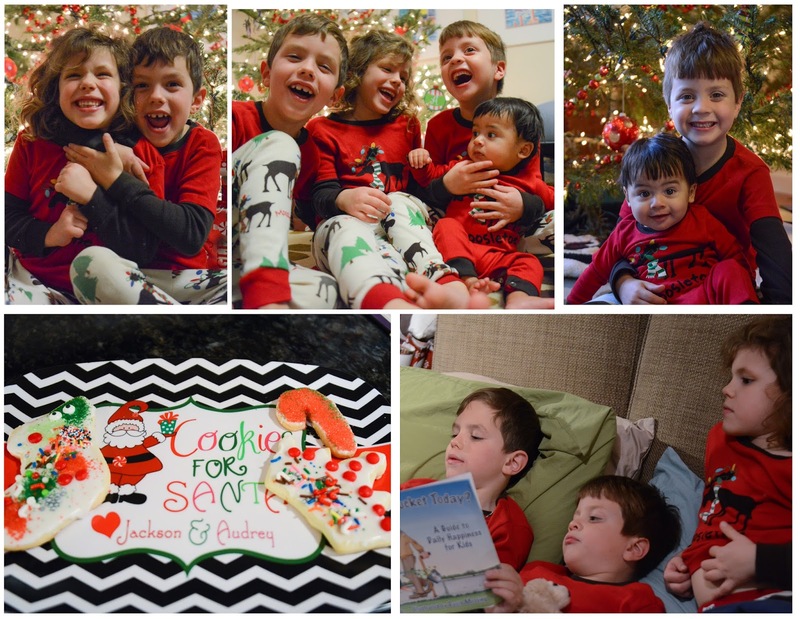 Jackson read everyone a book, and they snuggled into bed, anxiously waiting to see what Santa might bring! Christmas morning came early and was over quick! Jackson and Audrey were both beyond excited to find their most wished for presents under the tree. They both asked for Bitty Babies because they both LOVE taking care of babies! 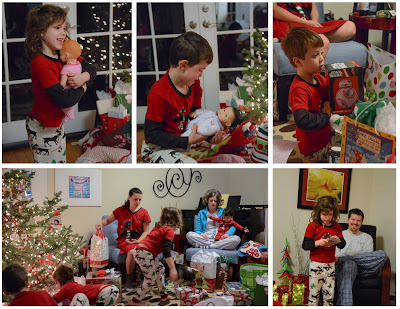 Then the chaos of gift unwrapping began. Before we knew it, we were done and had piles of paper and presents everywhere! We took a short break for cinnamon rolls and our traditional egg casserole somewhere in the midst of the gift exchange. It rained most days during their visit, so we were grateful for a break on Christmas day. 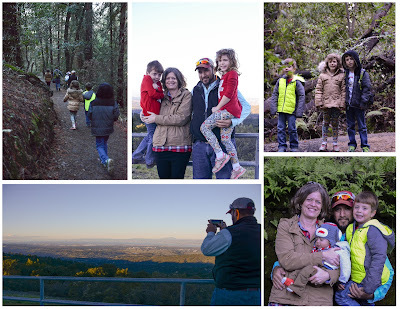 We took advantage of it by driving to Woodside, CA for a hike. It felt great to be in the beautiful outdoors! Even Taylor wore himself out, and fell asleep in my arms by the end of the trek. After our hike, I drove Leslie, Philip, Mitchell, and Audrey along the "skyline" where we enjoyed some picturesque views of the Bay Area. The next day we made our way to the Dell'Osso Family Farm for a little winter delight. 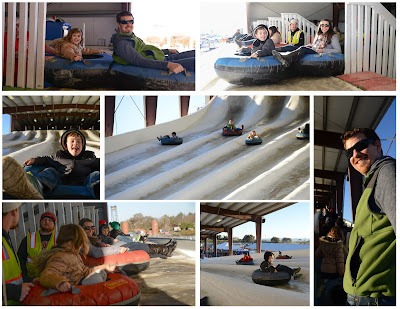 We started the adventure with some snow tubing. It was a blast! We had tickets that let us go down the slides as many times as we wanted for 90 minutes. Mitchell wasn't much of a fan, but Jackson and Audrey didn't want to stop! They rode with us on double tubes, as well as by themselves in single tubes where they could spin in circles. Every ride ended with a huge grin and often some belly laughs. While we were busy tubing, Mitchell and Leslie did some ice skating, which Mitchell loved! 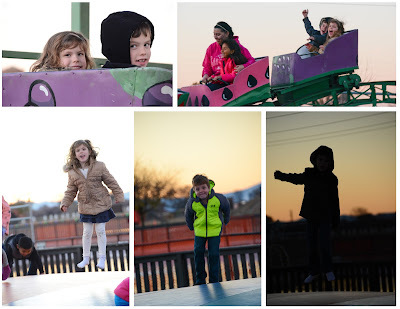 We all did a little snowball throwing, and the kids did some pillow jumping and roller coaster riding. I'd say it was a successful day! My dad joined us that evening, and the Taylor/Rodriguez family headed home the next day. We were sad to see them go, but we enjoyed every moment they were here! There are several more pictures in the album!